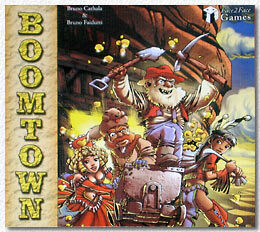 Boomtown is a game by Bruno Cathala and Bruno Faidutti. You perceive Faidutti's handwriting quite clearly: Boomtown is quick chaotic fun game. At the start of each turn, as many cards are put openly on the table as there are players. Then, the right to chose first is auctioned off. Since this auction is the heart of the game, let me illustrate it with a concrete example. There are five players A, B, C, D, E. A wins the auction and plays 11 coins. You don't pay to the bank, you pay to your right neighbour, in this case E who receives the 11 coins. But he's allowed to keep only half rounded up. So he keeps 6 and passes 5 coins to D. D keeps 3 and passes 2 to C. C keeps 1 and hands one to B. So, the nearer you are to the high bigger in counter-clockwise direction, the better. However, only the right to chose first is auctioned off. Second is the player to the left of the high bidder and so on. So, the nearer you are to the high bigger in clockwise direction, the better. Simple: Try to have the high bidder as neighbour. It's helpful. 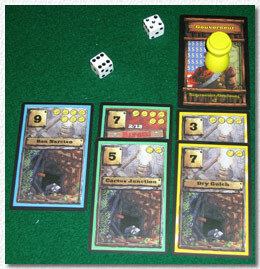 Most of the cards show "mines" with a gold value and a dice score. If this score is diced at the end of the turn (there's exactly one roll for all) you receive the gold value. If you have two mines of the same colour (every mine has a colour, there are 5 colours in all), you're mayor. Advantage: Whenever someone else buys a mine of this colour, he has to pay you the number of cards you own of this colour in gold coins. If someone ever gets more cards in a colour you lose the mayor status and he's your successor. The mayor mechanism allows for new tactics. Imagine you have 5 green cards and there are two green cards for auction. Nobody wants them because whoever chooses them has to pay you 5 coins. So, people will place high bids just to avoid drawing last while there is no need for you to get engaged since you'll get your gold anyway. It wouldn't be a Faidutti game without chaotic event cards. There are cards for destroying a single mine, for stealing a single mine, for receiving 10 coins from the bank, for stealing (announce a player, announce a number of X coins you want to steal, dice X or more, and you got it). This game would be bad if it were longer since there is too much chance, too much kingmaking, too fews ways to interfere. Since it can be played very quickly it works out if no-one takes it too seriously.